Recently a dear long time friend drove all the way from the Palouse to visit me here on the edge of the continent. It was special magic to have someone who’s known and been there for me for over 20 years come all this way to giggle and play and commune with nature with me like we used to do back in Idaho. The echoes of our laughter over trying to upload photos and videos we took while on the beach and the great conversations we had over bowls of plant-based food at my wooden “bar” while the birds sang outside made this house feel even more like home. The next day was overcast with rain looming, but in the late afternoon we managed to get in a quick car ride to the beach at Taft on Siletz Bay before it began. This is a place my friend had often brought her son when he was growing up and they would come camp on the Oregon coast. They’d come to the beach and watch the seals for hours. Because it’s a car ride for me, I had heard of it but never been there. So we set out with the dogs, me for the first time, and she to return to the site of many pleasant memories. The sky was milky grey and the weekend just done. The parking lot at this popular spot was empty and the beach was all but deserted, something I sensed was actually a rarity. Across the strait from us there were many seals lolling on the sand, and even a bald eagle picking his way at the edge of the water. As we walked to the edge of the beach, the water closest to us was thick with seals bobbing and swimming and feasting on fish. I have never seen so many wild animals at once. They twisted and turned, moving with strange ungrounded grace through the swells. I couldn’t take my eyes off of them. I stayed 20 yards or so in back of my friend, who had gone down closer to the edge of the water to capture their movement in a video with her phone. 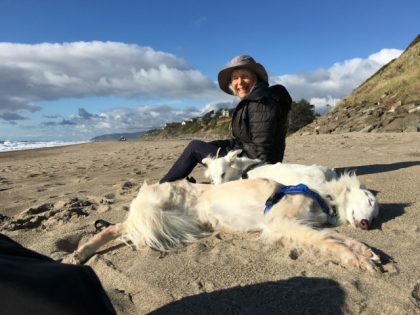 Because I had both dogs with me, I thought it would be best not to get too close, either to upset or provoke the seals, or tempt Cotton, who is not hip to how seals might hurt him if he got too close. As we stood and watched them, it became apparent to me they were watching me and the dogs just as closely. There was a moment in which one simply lifted his or her head out of the water and stared, point blank, into my eyes. And then she was gone, following the drop of the swell. I felt that gaze to the bone. A wild animal and I had regarded each other and though it must not have been for very long, while it was happening time stopped. The dogs stood quietly by me and joined in the looking, not as wild animals, but as domesticated ones who knew their place was to stay close to me. For this brief time we were all balanced in some kind of instinctual understanding on a border we can’t fully cross. Siletz Bay can be a place where baby seals are left to rest by their mothers while they go and hunt. The babies are sometimes left for up to 24 hours. Wildlife services posts a sign far away from the baby seal and volunteers make a perimeter of driftwood sticks around it. Often a volunteer sits on a log nearby to keep watch without being too close. We were lucky enough to see all this in motion that afternoon. The sleeping baby seal must have also caught the scent of the dogs. It lifted its head up from a nap, regarding us with calm interest, then flopped its head back down in the sand to resume its nap. There was one seal I noticed who was about to beach itself in this interesting way of rolling sideways up out of the water, but she saw the dogs and just as gracefully turned herself over back into the water. She stayed very close to the edge, patrolling, even though the dogs and I were far away from the edge and also far away from the baby. I wondered after if she was the returning mother, waiting until we were far enough away to come feed and claim her baby. It’s only a story I told myself, of course, a way of making human sense of movements I could never make with a human body. Mother seal or not aside, I could not shake the fact of the vulnerability of that baby seal asleep on the beach, with nothing more than air and scant spindles of driftwood keeping it from any number of human or animal mistakes or barbarisms. It was not protected in any high security way–it was on a public beach and yet it slept on, peacefully, awaiting the return of its mother. This baby, sleeping exposed on the beach, in the middle of what could often be a crowded beach, felt powerful in its wild grace. That I could witness such an experience in our imperiled world was a moment of wild grace for me, momentarily turning any sadness about the state of things I harbor into reverent amazement, and a strange off-beat sense of hope promulgated, ironically, by vulnerablity. When we got home that night, my friend suggested watching an animated film about Selkies she had seen. 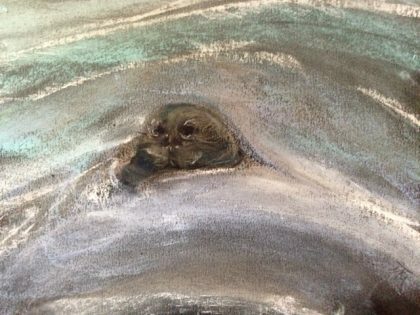 I was a little cranky about it (which, thankfully, is allowed with someone who has known me as long as she has) because I don’t much like animation, but mostly because I was still haunted by the gaze of the wild seal and didn’t want to impose mythology as meaning for what I had experienced. But I needn’t have worried at all. As it turned out the animation did not interfere with my experience, a relief that made me laugh at myself. It was so completely other that I got engrossed in the story and when my internet went wonky during a wind storm, I insisted we watch the last 10 minutes of it the next night, so, narrative junky that I am, I could see how it turned out. Then we turned to my friend’s photos and the video of the seals we had actually seen. I tried to talk about what that meant to me. It wasn’t anything like feeling a human/seal affinity, but more like two very strange creatures reaching across an abyss of difference to pay attention to one another for a few seconds. I was literally haunted by the wild gaze into my human and not so wild eyes. And I still am. I don’t have words for it, and oddly, I don’t want any. This place that I live in on the edge of the continent so often takes my descriptive speech away. I spend time staring at what I’ve never seen before, what changes every day, what I can’t believe I’m seeing, and yet it is right in front of me. The beauty and its terror. The splendor and its underside. The whales so close because the continental shelf drops off into deep water just beyond the first two sets of waves. 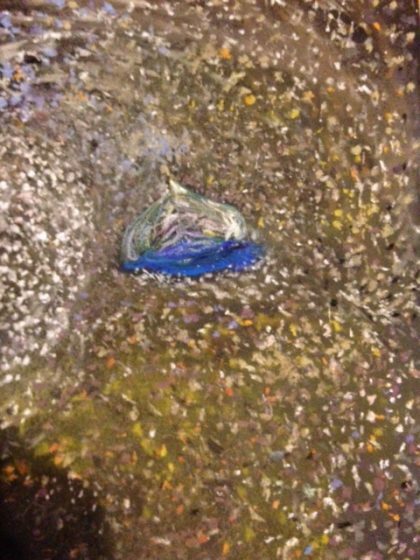 By contrast, one wind borne tiny jellyfish, the velella, is an amazing deep blue with a translucent “sail.” When it’s washed up onto the shore it’s not bigger than a small leaf. But when thousands upon thousands of them are washed ashore, strung in necklaces across the newly patterned sand, as they die and dry up they create a stench that permeates everything–for weeks. This, and looking into the eyes of a wild seal, and so many other things I see, imprint a strange and wild wordless poetry into my soul, brought on by the wind, the tides, the turning of night to day, the creek running over rocks into the ocean, the many creatures searching for food or a place to nest. It seems to me it doesn’t need to be connected to my thoughts, wishes and desires, or even to helping me be a better person. It just needs to be. One of the graces of a long time friend is that she always gets where I’m coming from, even if it isn’t exactly the same place I started out. We talked on the phone recently, our first extended conversation since her visit, to celebrate the new Gemini Moon. She offered an acknowledgment of the isolation and vulnerability I must feel in my new surroundings, wild and beautiful as they are, without a car or many distinctly “unwild” places I can walk to, as I once could in Moscow or Portland. She understands, too, that this is my soul’s assignment, to be here on the edge, in tandem with what she calls “primal nature.” I definitely agree, and was grateful for her careful term. When I first visited the coast last August, I was stunned by my need reorient my sense of time to the tides, rather than all the things back in Portland I was constantly trying to keep up with. I knew it was the kind of time I need to keep. It was profoundly relaxing and grounding to open myself to that “primal” rhythm. The longer I live with the MS and the other health challenges I have, the more discriminating I have become about the kind of stimulation I want to spend my energy on. It changes as I change, across the decades. In fact, following such promptings has become one of the fundamental ways I continue to live well with it. But that doesn’t always make it easy. It is isolated here. Getting things done is attenuated by getting from one end of the coast to another. And it can be lonely, though I’ve made new friends, not having anyone nearby who shares my history. But it also seems that my soul’s assignment is to live on the edge between the worlds, another phrase my friend articulated that I didn’t have words for. Whatever that means in primal nature and spirit, I can do it most effectively at this point in my life if I am here. Where else could I tuck myself in bed with my dogs, look out the window and realize in awe I must be looking at a faint glow of northern lights to the northeast, because there is nothing else below it but forest? It went on for another half hour or so. I could hardly believe it was possible, but a neighbor who is an astronomer said it was. A month later, it happened again. I got up and watched it from the sliding glass door. And no, often there are no words in this place ruled by the ocean. Just the calls of the mourning doves, the pound of the surf, the wind through the trees, through my hair, across the dog’s backs, the light white diamonds on the water against the shadow of gray clouds. This memory sketch at the top of the post, attempting to capture the gaze of the wild seal. How lucky I am, despite the challenges, to have looked into the eyes of a wild animal. And to be seen through the eyes of a long time friend. Both soothe my soul, make my life rich with these wild states of grace. I love hearing about your adventures on the beach and how wonderful to have a good friend to share it with. Was just reading about the folks in Southern California who count the whales as they migrate. How amazing to be able to see them. Look forward to hearing about mire ocean adventures! I love your stories, the feelings behind, the world you share. I so look forward to your emails. These ones especially since your move to the coast. The way you describe the scenery and the animals you come across puts a wonderful picture in my mind. As an east coast girl wishing I could visit the west I really appreciate this. Thank, Dearest Peggy, for this lovely thought. Just what I needed to read right now. love and light back to you! Thank you for so evocatively and masterfully bringing us all into your new habitat. It speaks volumes that, when I read this post upon waking up, I felt entirely transported from my customary morning landscape of concrete and building tops and water towers! I’m so glad that you were able to share it with a friend who has known you for so long, who has the wisdom and intimacy to so thoroughly understand your choice to be where you are at this moment in time. I hope her presence made you feel a little more grounded and witnessed and held in your new space. I can definitely understand how the power of your moment of fixed gaze with the seal defies any sort of customary language, and I’m glad that you’ve brought the moment to life for us without trying to characterize or detail it in a way that would diminish or simplify it. I love the image of three types of animals–human, domestic, and wild–existing peacefully together at a single point in time; seems like the kind of coexistence we dearly need these days. Maria, your experience of gazing on the seal and it gazing back at you is very similar to one I had: but with a wild hawk. I never expected that. It just sat there, on a sign actually, about five feet off the ground. I didn’t want to go too close, but it let me get about ten feet away. And then we both just looked. Fantastic. Thanks for this post; it’s lovely. Thank you Pat! What a beautiful experience you had with the hawk. I appreciate the kind words about my post and also that you shared your own similar experience here.